Greggs is the UK’s leading bakery retailer. With 1,350 shops nationwide, a Greggs or Bakers Oven branch is never far away. The company serves over 5 million customers each week throughout all of its shops. A large proportion of Greggs’ business is in takeaway food – principally shop-made sandwiches and freshly-baked savoury products. The company also operates catering units through its Bakers Oven brand. To keep the operations running smoothly on a daily basis, the company has recently invested in service desk solutions for each of its 14 business divisions. The service desk staff provide both IT and operational support to 19,500 staff across its shops nationwide. Incoming calls are logged and tracked using service desk applications built on Hornbill’s Supportworks Enterprise Support Platform (ESP). The company selected Hornbill having initially been impressed with Hornbill’s IT Helpdesk and felt that adopting a common service infrastructure would benefit the company even more. Greggs runs multiple desks on the single Supportworks Enterprise Support Platform, with each desk using a customised application depending on business need. As well as the service desks in the divisions, Greggs has a central service desk where all information, including all calls taken within the divisions, is managed and which provides management reports that cover the entire organisation. Each divisional IT team handles first line support calls locally, and refers more complex second line calls, that can’t be dealt with by the division, to the central head office IT support desk. The customer service desk handles customer calls from the general public on all aspects of Greggs’ business. Since implementing Supportworks for IT Support Desk and Customer Service, Greggs has also customised and implemented two further helpdesks – one for its internal distribution service and one for its facilities management service desk. Staff on the internal distribution service desk receive calls from the stores regarding deliveries – on damaged goods or orders not received. Warranty information is stored on assets (such as fridges, ovens and tills) to enable service call outs to be arranged. Services or repairs are handled either by the company’s internal engineers in the field, with a high priority text message sent, or passed to a third party engineer if appropriate. Recording asset information centrally has significantly reduced overall maintenance bills, since the company now has accurate records of warranty dates and policies, which were previously recorded manually or on Excel spreadsheets and were often difficult to access. Not only has the accurate central asset data meant significant savings in handling warranty issues, common problems can be identified and acted upon, reducing the overall number of calls. Within each division, Greggs has IT and administration staff providing support. The admin support staff use a customised version of the Hornbill system for facilities management – specifically shop maintenance. Requests from shops for maintenance issues – on ovens, electrics and internal shop fittings – are all logged and handled at divisional level. The similarity of the user interface also enables support staff for either IT or operations to cover for others in case of absence. Within the customer service desk, letters have been standardised to give customers common messages using Microsoft Word. 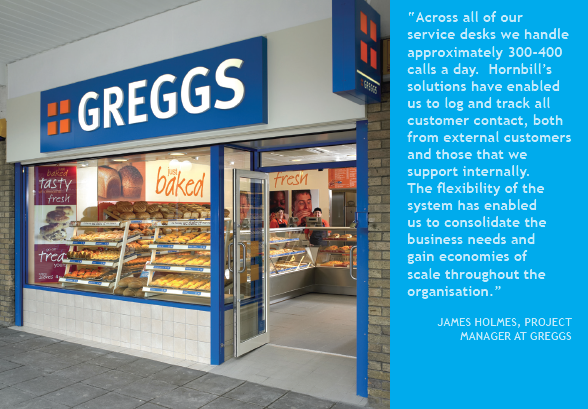 As well as logging incoming calls, Hornbill worked with the IT team to integrate the system with Greggs’ website. With all of the customisation work carried out, Holmes has spent considerable time preparing manuals and user training designed specifically for the business user. Support call screens are tailored for the facilities management team (shop maintenance) to reflect the type of call that they handle. Part of the customisation includes call routing, whereby parameters have been set such that when a call comes in it is routed according to the nature of the requirement. For example, a call about a hard disk problem is routed to the IT network team, while an EPOS call (till problem) will be routed to the appropriate service centre for the shop location. In addition Greggs has customised the facilities management system to monitor the temperature of the tills in stores. Calls are automatically logged into the system if any problems are encountered. Automating the checking of till temperatures in this way has significantly reduced the number of service calls since engineers are able to apply pre-emptive maintenance. The GDS service desk system has also been customised, enabling shops to call in if an order has been missed or damaged, logging a call against several products if required.